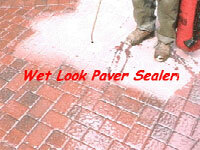 Sealing your Brick Pavers will protect from spills and stains. While the sealer does not stop 100% penetration it will help "deep" penetration from oil spills, rust from water, dirt, grime, etc. making future cleanup easier! Using a paver sealer will enhance the natural tones of your brick pavers with a "wet" look. This will darken the color similar to as if they were wet with water. The sealer will also add a shine to the pavers. The shine level is dependent on the porosity of the cement pavers but does come in a High Gloss, Semi-Gloss, and a Matte Finish. Sealing the brick pavers will protect the original color and appearance. If they are not sealed the pavers will dull and will look "pitted". This is a result of natural weathering and traffic. Joint Sand loss from natural weathering, weeds, and insects is a common problem. Sealing your pavers can harden the sand and prevent this from occurring. What about Travertine and Flagstone sealing. Wet look or gloss sealers will not work well for natural stone. Dries blotchy. I would look at the SuperSeal25 ([url]SuperSeal25-Semi-Gloss-5-Gallon.html[/url]) or the SuperSeal30 ([url]SuperSeal30-Gloss-5-Gallon.html[/url]). Both are high quality sealers for pavers. They enhance, leave a gloss sheen, and are non-yellowing. Good morning. I sealed our patio brick pavers (purchased at Lowes) and they looked terrible. I wanted to enhance the natural tones of our brick pavers with a "wet" look. The sealer added little shine to the pavers and left them yellow with a lot of sand trapped in the material. I ended up spending hundreds of dollars to purchase a chemical to remove which took days and days using my powerwasher. The porosity of our cement pavers seems to be very high. What do you recommend?